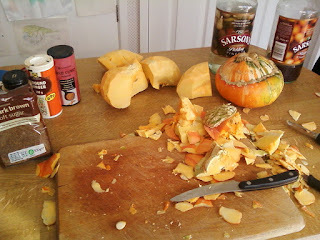 As it's getting a lot colder now (frost predicted tonight as I write this) and the 2 pumpkins in the allotment looked ready, I picked them on Saturday and proceeded to turn them into chutney. The variety of pumpkin is "Turk's Turban" - you can see why from the picture above. 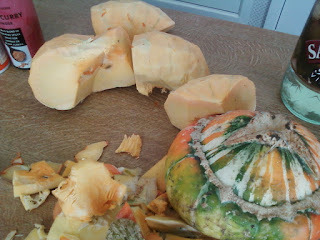 Now, these pumpkins were really tough to get through - I still have the blisters from peeling and chopping them! However, there was much more flesh per pumpkin than you get in the traditional ones for Halloween, and a lot fewer seeds. I'm using just over half a bottle of Sarson's pickling vinegar (like most other British brands nowadays it is owned by another company, in this case Crosse and Blackwell, though I would imagine someone else owns them by now....). It's ready spiced so there is no messing around with a small muslin bag of pickling spices - you can of course do this if you have your own secret pickling recipe! 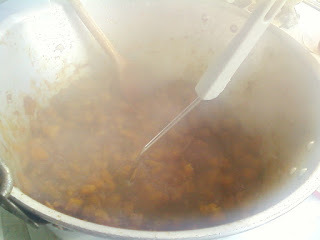 Also a 500g bag of dark brown sugar, some ginger, curry powder and garam masala, although of course you can add your own spices to taste. The pumpkin was chopped up quite fine into rough cubes about 1cm cubed. This is the chutney bubbling away in my mum's jam pan that I think dates from pre-war and didn't get melted down for Spitfires... It's steaming away just as much as the Icelandic hot springs we saw last year, and although not a sulphur smell, it is really quite a strong vinegar smell. So much so that when my daughter came back up the street from a walk she could smell it from 3 houses down the road! Anyway, the two pumpkins made 7 jars of chutney, now all I have got to do is keep my hands off them for a month or two while they mature!